I never knew before finding this in the 11th Encyclopedia Britannica that bananas are actually classified as herbs. 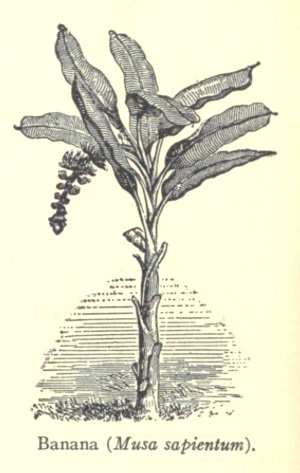 And while most of us would call it a banana tree drawing, it is not a trunk but a stem from which the leaves and fruit grow. For the most part, this is a nice black and white banana tree drawing but, I wish it had some bananas hanging from the flowering stem. I think it could be made extra pretty with the addition of a bit of green and yellow coloring.